A Texas student will face no disciplinary action for a rant at a teacher — which was caught on video and uploaded to YouTube before being shared nationally on social media. The teacher, the district said Thursday afternoon, has been placed on administrative leave pending an investigation about what led to the outburst. The district, which has not revealed the teacher's name, said the action is standard procedure in such an investigation. The original video was taken off of YouTube, but various postings online show the video (embedded below) has been viewed hundreds of thousands of times by people across the country. 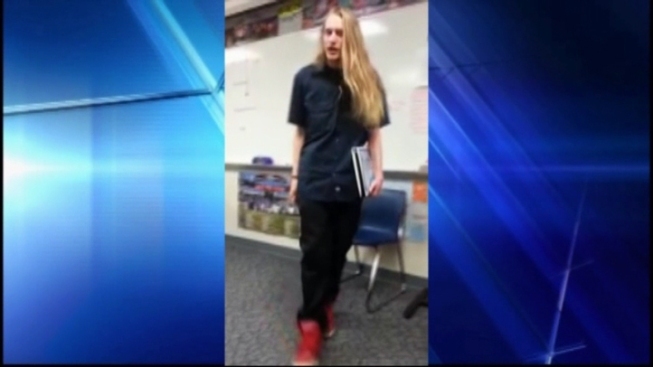 In the video, recorded at Duncanville High School outside of Dallas, student Jeff Bliss expresses his frustration with the way his teacher communicates with students. "If you would just get up and teach them instead of handing them a freaking packet, yo," Bliss said in the video. "There's kids in here that don't learn like that. They need to learn face to face." "You've gotta take this job serious," Bliss continued in the video. "This is the future of this nation. When you come in here like you did last time and make a statement like, 'Oh, this is my paycheck' - indeed it is. But this is my country's future and my education." While Bliss continued on, the teacher repeatedly asked him to leave the room. "I'm telling you what you need to do," Bliss said in the video. "You want kids to come into your class, you want them to get excited for this? You gotta come in here, you gotta make them excited. You want a kid to change and start doing better? You gotta touch his freaking heart. You can't expect a kid to change if all you do is just tell 'em." On Thursday, officials with the district said Bliss met with the school principal, is facing no disciplinary action for his comments in the classroom and is attending his normal class schedule. "As a district with a motto of engaging hearts and minds, we focus on building positive relationships with students and designing engaging work that is meaningful. We want our students and teachers to be engaged, but the method by which the student expressed his concern could have been handled in a more appropriate way." The district said it will remain open to listening to students regarding their concerns about their education.